omg.JYJ's performance wow. a great news.really hope Yoo Chun will win a new actor and popular awards. I hope Yoon Si Yoon to be nominated for Best Actor or Best New Actor... he really got the talent and not just hype... I know KBS will reward Baker King for being the highest rated drama all over the past decade!!! When will be the nominees revealed? Click the link to participate in voting~! It's been somewhat unpredictable. For last year, only netizen and couple awards were revealed in advance. If I remember correctly, there was no announcement for the other categories until the very last minute. There was no list at all for SBS's last year, we had to type up the nominee/winner list as we streamed the show live. Maybe they wanted to edit the list on the fly (dependent on who'll show up), I really don't know. lol. @robbo4: agree that it's cool to see the show live with english subs. @koalabear: hey, it's been a while. 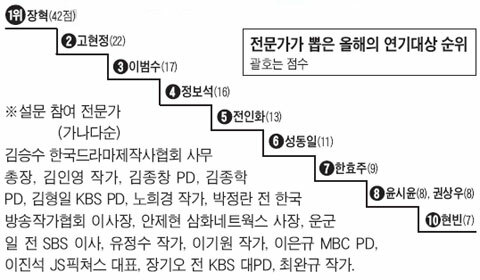 I wonder if the ceremony being shown on KBS2TV will be subbed. Thanks everyone for posting & sharing. ^ yes it's been a while @kdramafanusa. thanks for creating this thread and will look forward to more updates. List of Nominees for Best Couple is out. Jang Geun Suk & Moon Geun Young - Marry Me, Marry! Go Yoon si Yoon!!! Can people outside Korea vote? Si Yoon already won a popularity award in an award giving body! Go Go Go !!! Aja!!! How did the two little girls from Gumiho's Revenge become a "couple"? 'Yeon-yi' was cute and sympathetic there, but Seo Shin Ae (tremendous range of character and emotion, she's peerless as an actress in her age-group in my opinion, if you haven't seen her as 'Lee Bom' in 2007's Thank You, do yourselves a favor and get right on that one. It also features the very best of Yang Hyuk and Kong Hyo Jin and a killer performance by veteran actor Shin Goo. ) simply owned that drama. P.S. Kim Eugene for the win!!! This must be the most exciting tv stn award compared to other rival stns. KBS just having so many hits drama this yr.
why netizen award never include actress from daily drama? i thought their acting is as good as the actress/actors from prime time drama even better and also the rating is higher than the prime time drama. example Fine windy day overall rating is better than cinderella sister ( i notice that this two drama aired within the same period). Jin Yi Han (Fine Windy Day)acting is outstanding and on the same par with other actor in the netizen nomination. right now i'm living in korea for an exchange program, and i really want to come watch the kbs award live. can somebody tell me how to get there? and how to attend the show? 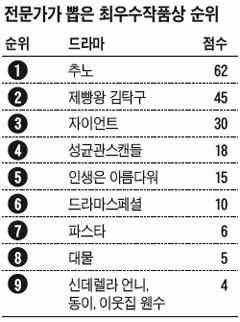 Chosun Ilbo invited 15 drama experts (PD, writers) for their choice of this year's best drama and acting awards. 1st to 5th place: 5 points, 4 points, 3 points, 2 points, 1 point. WOOTT!!! Gotta watch this! JoongKi will be MC-ing! Kim Hee Jung MUST WIN FOR her role as UMI in THREE BROTHERS. She was absolutely spectacular and divine this year in that role. Anyone who beats her will prove to me this award show is a lost cause....except for maybe Lee Mi Sook and Moon Geun Young in Cinderella's Sister. They weren't a fraction as good as Kim Hee Jung, but they sure were excellent. Oh and of course Yoon Shi Yoon should win multiple awards! He is amazing! I just have a strong feeling that Jang Hyuk may win the Daesang . He was simply outstanding in Chuno.